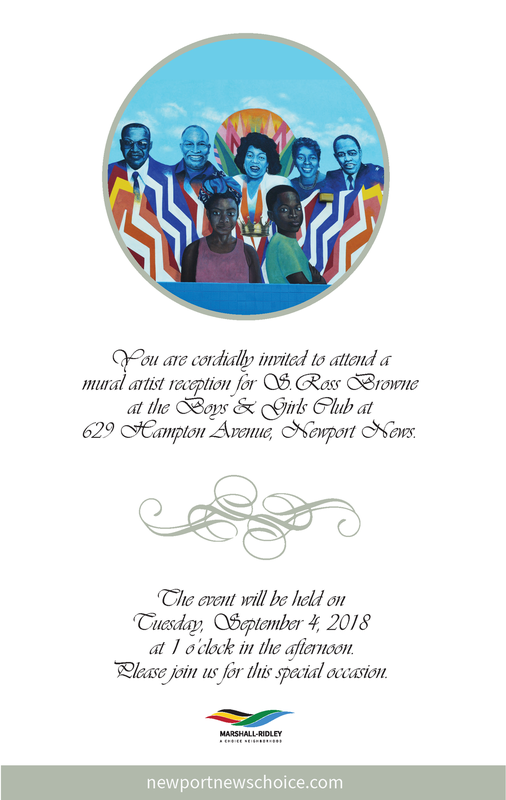 The Department of Planning for the City of Newport News invites you to attend a reception at 1:00 pm on Tuesday, September 4, 2018 to celebrate the mural created by artist S. Ross Browne at the Boys and Girls Club at 629 Hampton Avenue. The mural is part of the Arts in Communities Early Action Activity for the Marshall-Ridley Choice Neighborhoods Initiative. Mr. Browne was the artist chosen by residents to create the mural, which celebrates the history and culture of the Marshall-Ridley Choice Neighborhood through the arts. It is a colorful depiction of community leaders and key landmarks in the Southeast Community. Mr. Browne has personal connections to the Boys and Girls Club of America, having attended the chapter in Mount Vernon, New York as a child. He has also taught art at the Church Hill Chapter in Richmond, Virginia. His artwork typically features portraits of African Americans and imagery that is rich in cultural and historical context. Mr. Browne stated that his goal for this mural project was to use vibrant colors to convey a message of hope to young people in the community and to remind them that “you are magnificent”. The Choice Neighborhoods Initiative (CNI) leverages public and private investments to replace distressed public housing and transform neighborhoods of concentrated poverty into neighborhoods of opportunity. In 2016, the City and the Newport News Redevelopment and Housing Authority were awarded a CNI Planning Grant from the U.S. Department of Housing and Urban Development to develop a Transformation Plan for the Marshall-Ridley Choice Neighborhood, a one-square mile area located in the Southeast Community. The Transformation Plan, which is in early stages of implementation, focuses on four critical areas: people (supportive services), education, housing and neighborhood (safety, economic development, workforce development). Arts in Communities was one of the Early Action Activities in the Transformation Plan and was coordinated by the resident-led Early Action Activities Subcommittee. For more information about CNI, visit newportnewschoice.com or call 757-926-8671.